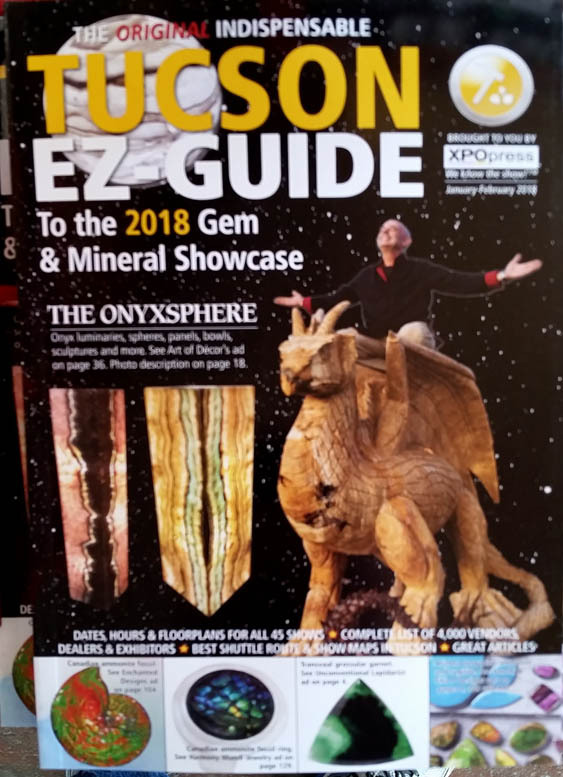 Each year, in late January to early February, mineral dealers, prospectors, buyers, collectors converge on Tucson, Arizona for the annual series of gem and mineral shows. There are over 20 different shows scattered around town, each with a different schedule. Most of the shows are set up in hotels and motels, with dealers selling out of their rooms. It is probably the largest mineral "convention" in the world. Every mineral collector should make the pilgrimage to Tucson once in their life. Amazing minerals are on view, better than you will see in any museum. (Sadly, museums cannot afford to buy many really good mineral specimens.) There are also great opportunities to buy minerals at lower than normal retail prices, because of fewer intervening middle-men. There are great minerals to buy in every price range from $5 to $500,000. And it is a great time of year to get away from winter weather and visit a sunny, warm vacation spot. But it can be very confusing for the first time visitor. The first time I visited Tucson, a friend who was a longtime veteran of the Tucson shows, took the time to give me an introduction to the shows. As we drove around the city, he pointed out the shows that were mainly minerals, explained how business was conducted, and answered my questions. It really helped me as a beginner. Ever since that first visit, I have offered my time to other first-time visitors to help them get settled in. 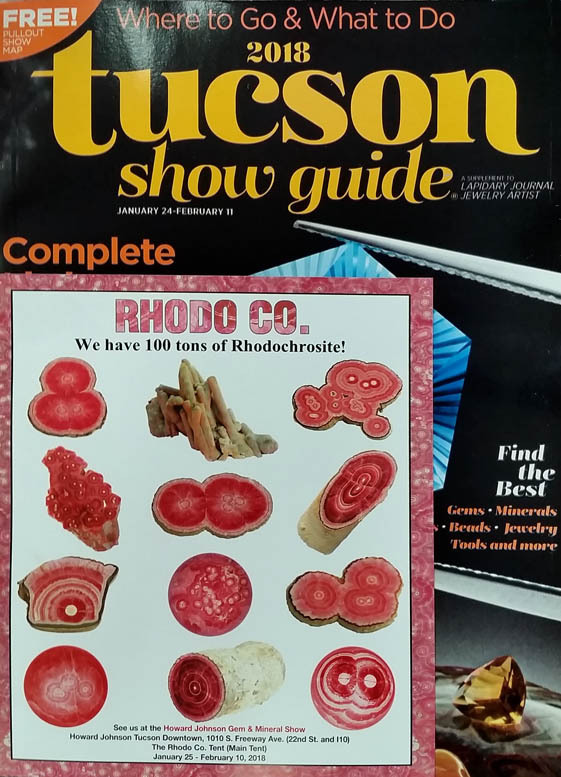 This article shares the same guidance with a larger audience and is an introduction to the Tucson mineral shows written specifically for mineral collectors or mineral dealers. I don't know gems, gem rough, jewelry, or lapidary equipment and this article will not make any attempt to address those specialties or the shows that cater to them. The article will cover the basics of the Tucson shows and answer the frequently asked questions. 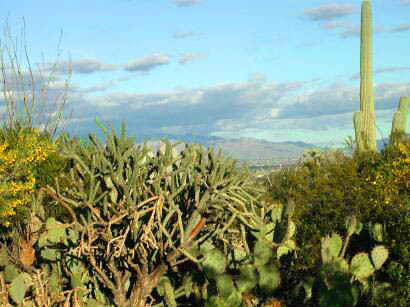 Most visitors fly directly into Tucson and rent a car. I do not think there is good mass-transit from the airport. It is best to take a taxi. A few fly into Phoenix because the airfare is cheaper, then rent a car, and drive the 2-3 hours down to Tucson. Tucson is not a good "walking" town. Be certain to select a hotel near the shows so you may access the show shuttle buses easily. You should consider booking a room no later than August. If you want to save on lodging, try looking at AirBNB or VRBO. It is possible to get around the Tucson shows without a car. There is a free shuttle bus service that operates on 3 routes making all shows accessible without a car. Once you are at a show, it is easy to move to the next, and many shows are close together and you can walk between them. But you should select a hotel that is near the shows so you may easily get on the bus. I stay at a hotel that is 2 miles from the nearest show which requires an automobile. Parking at several of the shows is horrendous. Not having a car can be an asset. But if you are buying heavy mineral specimens, having a nearby car to drop your purchase off between visitors is an advantage. You might also consider using Uber, Lyft, or Via. Travel Hint: upon arrival at the airport, you will see Tucson information tables with brochures and information on local sights. Take the time to pick up a few items that interest you. 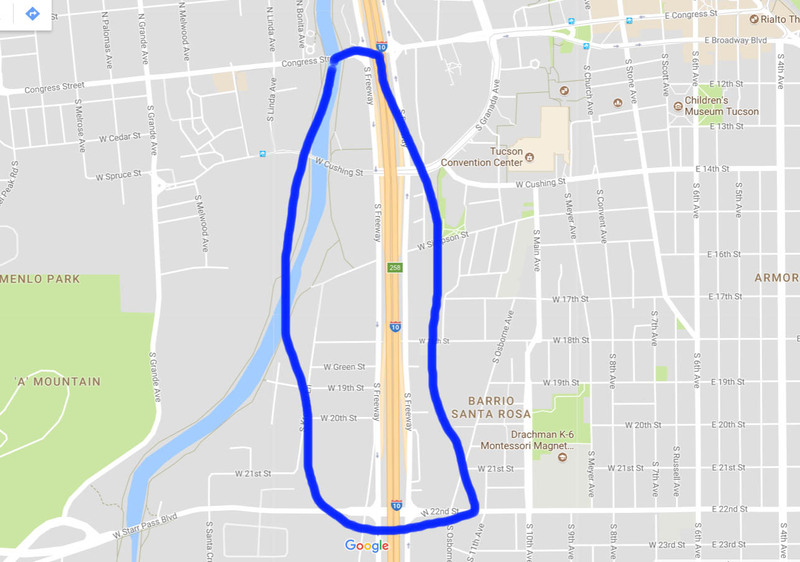 Most of the mineral-oriented shows are centered around Interstate 10 (I-10) that runs roughly north-south along the west edge of downtown Tucson. Proximity to I-10 makes traveling to the shows easy and provides a central landmark if you get lost. In general, mineral buyers will restrict their travels to a 10 block area. Retail dealers: selling regular show stock of retail minerals. They are set up in Tucson just as any other show. Most likely they have their best material on display at this show in order to attract the attention of the serious collectors that attend the Tucson shows. Wholesale Importers: bring in large quantities of minerals from a specific country or region and are looking to sell out their stock by the end of they show. Commercial Collectors: they dig minerals in the field throughout the year, often at claims that they own exclusively. They bring their year's worth of production to Tucson to sell. When you first meet a dealer, you must assess what type of dealer they are. Each type of dealer can fill a special need. At the retail dealer, you should recognize that Tucson is just another show for them and the price you pay will be the same in Tucson as it will at the next show they do in a few weeks. But they have brought their best material to this show (often they have saved the REALLY special minerals specifically for Tucson.) So you should ask the dealer if they have anything new or special. Remember, the dealer knows his stock better than you - use their knowledge to make sure you don't miss anything that a casual viewing of their minerals may not reveal. The wholesale importers may have a large stock of minerals, in many levels of quality and prices. You should look for new finds among their stock, since it is possible they may have a mineral find that nobody else has. There is also the possibility that they have a new find, but don't know what the mineral is or it is possibly misidentified. This is your opportunity to take a gamble and pick up a specimen that may actually turn out to be something exotic. Commercial collectors offer inexpensive minerals from obscure localities. These are my favorite types of dealer. They spend the year digging minerals and are selling them at moderate profit. Every year I look for certain collectors with minerals from Alaska, Arizona, New Mexico, Oregon, Washington, California. Even collectors from overseas will show in Tucson if they make a really big find. Because field collectors may not have big finds every year, they may not attend Tucson every year. This results in their displays being at the fringe shows, not the big venues that have regular dealer rosters. Travel Hint: Because dealers and attendees fly into Tucson from all parts of the world, it is common to get a cold or flu while in Tucson. Wash your hands frequently, avoid shaking hands and be prepared with medication. The Tucson flu is known as "Tucson Grunge". Net: The purchaser pays full the price marked on the label. Keystone: 50% off the price marked. The purchaser pays one-half the price marked on the label. Double Keystone: 75% off the price marked. The purchaser pays one-fourth the price marked on the label. Triple Keystone: 66% off the price marked. The purchaser pays one-third the price marked on the label. This term is not used much these days. Wholesale: The purchaser must have a retail business and have proof of the business with resale certificate. All wholesalers require resale licenses. INTERLAGOS: The letters correspond to the numbers 1234567890. A mineral priced "NTR" = $235. Look around a dealer's room when you first arrive looking for any of the terms above in signs on the wall. These will indicate the pricing plan used by the dealer. There is no standard pricing system, you can make no assumptions. If there is no indication in the room, ask the dealer how the minerals are priced. It will avoid confusion in your dealings. Unfortunately double keystone and triple keystone are rarely used these days. Sadly, finding deeply discounted bargains may be a thing of the past. There are many shows that make up the Tucson show circuit. They are at scattered locations throughout Tucson and have staggered start dates and end dates. The Main Show: All of the various shows grew out of the original Tucson Gem & Mineral Show (TGMS), also known as the "Main Show", that is held at the Tucson Convention Center by the Tucson Gem & Mineral Society. It is not called the main show for nothing - it is BIG. All of the dealers hold their best specimens to display at the main show. As with any show, there are display cases, lectures, wholesale and retail dealers. But at the TGMS everything is bigger and better than any other show. The best museums will present display cases that relate to the theme of the year's show or may display their best new acquisitions. The competition display cases are the best in the USA. The mineral dealers are among the best in the world. In addition to the show, there is simultaneously a mineral symposium of lectures usually focused on a particular subject or region in the world. The lectures that are part of the mineral symposium are given by mineral experts from around the world. 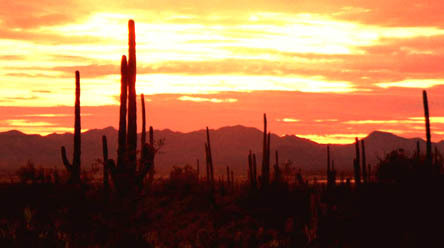 The bottom line is: the TGMS is what makes visiting Tucson worth a trip from around the world. It is a must for the first time visitor and any travel itinerary should plan around the TGMS. Before the TGMS are many "jump start" or "satellite" shows at the surrounding hotels and motels that started because wholesale mineral dealers wanted to sell to the visiting dealers prior to the predominantly retail TGMS show. The early wholesale shows were immediately successful and eventually took greater importance. Each year the satellite-shows started earlier and earlier in order to capture the early sales. In recent year, the early shows are trying to cut back duration to the 10 days prior to the TGMS. But serious buyers start lurking in the hotels in mid-to-late January hoping to be the first to visit a dealer while he is unpacking his new offerings. Travel Hint: At any of the shows, pick up a Tucson Show Guide. This is a heavy ,complete directory of all shows, dealers, information on shuttle bus routes, and a calendar of special events. IT IS THE ONE SOURCE FOR ALL INFORMATION ABOUT DEALERS. If you are looking for fresh water pearls, or for meteorites, or fossils, or gemstones, this book has dealers listed by category and is the best way to locate the dealers selling what you want. Below is the real Tucson Show Guide. Do not be fooled by imitators to the right. This is the one that has ALL dealers listed and ALL show venues. One tip-off to the genuine guide is that there is always (in past years) an advertisement for Rhodo.Co pasted to the cover. The is the MetaGuide targeted for metaphysical dealers. Grab one if that is what you are looking for. 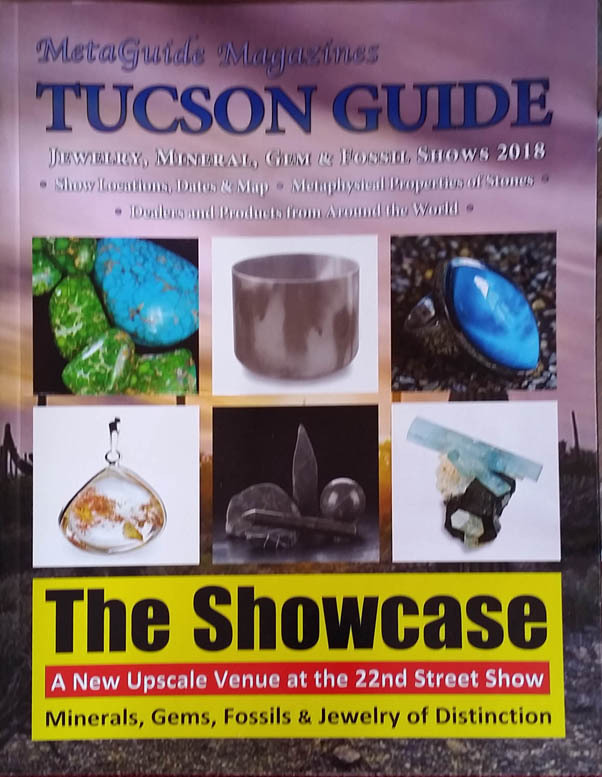 But it is NOT the Tucson Show Guide and does not list all dealers. The is the EZ-Guide and has an incomplete list of dealers. I see no point in grabbing more than one guide, so why bother with this - it is NOT the Tucson Show Guide. 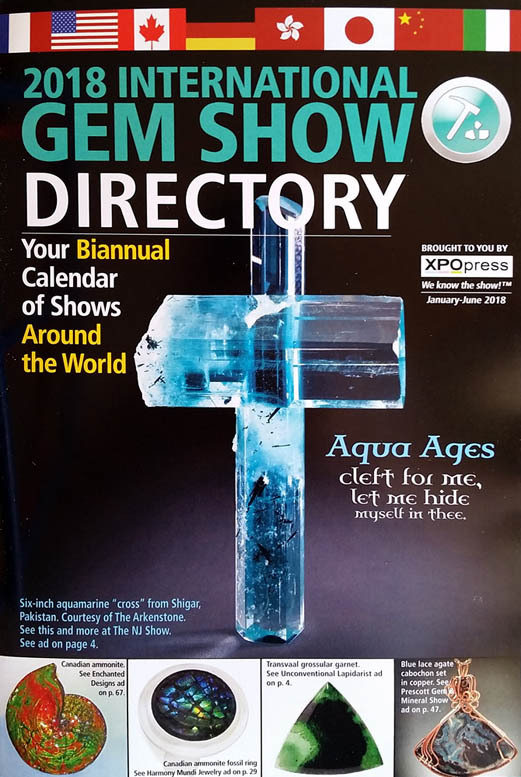 This is the Gem Show Directory, another wanna-be. Why get a look-alike. Get the real Tucson Show Guide. Mainstream Hotel Shows: Entire hotels are booked with mineral dealers. Every dealer sets up displays in their room and then sleep in the same room at night. Though the hotel shows started out with wholesale dealers, you will find many retail dealers set up too making it confusing as to whether you are paying wholesale or retail prices. Fringe Hotel Shows: These are the less popular hotel shows often far removed from the city center. Usually they cater to a particular industry (tools, machinery, gemstones, jewelry, gifts, etc.). If a mineral dealer arrives in town without a place to display arranged in advance, they will often find space in the fringe shows. It is worth checking out the fringe shows, especially after the dealers have been open for a week or so, because most likely they have poor sales due to their obscure location. If they are in a bargaining mood you be able to pickup up some good deals. Wholesale Dealer Facilities: There are several wholesalers that have their own facilities in Tucson. There are several Arkansas quartz wholesalers as well as wholesalers that have large facilities for handling large quantities. The ordinary collector will find little of interest at these dealers. Proof of tax exemption (resale certificate) may be required at these wholesalers. Most notable are Top Gem, Midwest Minerals, Jewel Tunnel Imports, Howard Schlansker, Roc 3000, Holguin Minerals, Minerama. Tent Shows and Boatner's Garage: Along Interstate-10 (I-10) the major north-south highway along the west side of Tucson, are several shows set up under large tents. 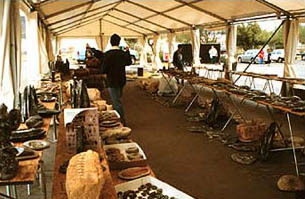 These dealers often have non-mineral items like pottery or African art. But once in a while you will find a dealer with some good minerals. If you have the luxury of time, it is worth walking through these shows. One year I found a dealer in the tents that had just arrived from China with bright green emerald crystals in matrix. I made a great deal with him because few others had found him. I was able to buy these emeralds a full year before any other dealers had them. Travel Hint: When planning your trip, build you itinerary around the TGMS. This show is a must see. In the old days this was a real problem. The AGTA held their show for gemstones simultaneously with the mineral shows. Hotel and motel rooms were in short supply. But the AGTA has shifted their schedule a week earlier. Plus many new motels have been built in Tucson. As a result, there is no longer a shortage of rooms. However, the inexpensive rooms are in short supply. Motel chains like Motel 6 have nice rooms for around $75 per night. But getting a reservation (at least during TGMS week) can be difficult. It pays to spend a day on the phone hunting down good prices. Late reservations often mean you will pay $100-150 per night for a room. If you find yourself facing that kind of pricing, I recommend the Best Western Royal Sun. It is conveniently located to the best mineral shows, has nice rooms with pool and Jacuzzi. When Should I Go? How Long Should I Stay? 4 Days Visit the best hotel mineral shows for 2 days and spend at least a day at the TGMS. One day for sightseeing. 1 Week Arrive a week before the TGMS to buy at the early jump start shows. Spend a few days sightseeing. Then visit the TGMS at the end. 2 Weeks Arrive 2 weeks before TGMS, and look around the hotels to see the dealers that set up early. Visit each satellite show as they open. Take a week-long tour around Arizona sightseeing (Grand Canyon, Petrified Forest, etc.). Return to Tucson for the TGMS. Attend the mineral symposium lectures part of the TGMS. 4 Weeks Arrive 4 weeks before TGMS. Drive to Quartzite, Arizona for a more down-to-earth mineral "bazaar". Travel back to Tucson and follow the 2 week schedule above. Perhaps make a 3-day trip field collecting in southwest Arizona. As a veteran of many Tucson shows, I arrive two weeks before the TGMS, spend 3 days buying at the early jump start shows, pack my minerals in boxes to ship home, then fly home before the TGMS starts.It is not uncommon for me to spend my budget within 48 hours of arrival in Tucson. Beautiful! Most years it is sunny and warm during the days and short shirt sleeves are fine. It gets cool at a night, so bring a lightweight coat. Pack an extra sweater in case they get a cold spell and bring along an umbrella in case of rain. Travel Hint: If you have allergies or hay fever, be sure to bring your medication with you. Every allergy sufferer I know has allergy attacks while visiting Tucson in February. Are the Shows Wholesale Only? The early satellite-shows started as wholesale only. However, in recent years it has become much more relaxed. Most hotel dealers will sell to anybody. Few shows seriously enforce the wholesale only rules. The lesson for first time visitors: don't be deterred by a "wholesale only" show. You may be turned away for lacking the proper credentials, but no harm will be done. Travel Hint: If you are a dealer, bring lots of copies of your resale certificate and business cards for proof of tax exemption and to make transactions faster. What Are The Best Shows? TGMS Second weekend in February (Friday-Sunday) The BEST of everything! Minerals, displays, lectures, etc. The best in the world. MUST SEE. Hotel Tucson City Center (formerly Inn Suites) Opens 11 days before TGMS. Minerals from around the world. My current #1 choice among the early shows for mineral collectors. However the parking at this show has become horrendous. Be prepared to park at a remote lot and catch the courtesy shuttle bus to the hotel. Days Inn on west side of I-10 Opens 14 days before TGMS. Minerals, meteorites, rough Good prices, lots of variety. Clarion Inn on west side of I-10 Opens 16 days before TGMS. Mostly Afghan./Pakistani dealers of gem minerals and rough. Not as good as it used to be. Many dealers are moving to other hotels. Ramada Limited on west side of I-10 Opens 11 days before TGMS. Fossils with scattered mineral dealers Bargain can be found among the mineral dealers because they are off the main "mineral" circuit. Lots of fossil dealers here. Westward Look Resort on Ina Road Opens 6 days before TGMS. Exclusive, high-priced minerals Way off the beaten path in a quiet resort. Expensive minerals. Closes before TGMS. Riverpark Inn on west side of I-10 Opens 12 days before TGMS. Worldwide mineral dealers Many mineral dealers are in a wing on the south side of the hotel. Good prices and good minerals. One of my favorite shows. Mineral &Fossil Marketplace at Oracle and Drachman Opens 12 days before TGMS. Tents filled with large importers/wholesalers from Mexico, Morocco, etc. Some local collector/dealers sell here too. Worth a visit even though it looks like just another show. The New Gem Center (formerly Boatner's Garage) south of Days Inn on west side of I-10 Opens 12 days before TGMS. Eclectic mix of many low end dealers, but some good mineral dealers can be found here. Worth the visit if you have time. You never know what you will find. Elks Lodge Opens 10 days before TGMS. A group of retail dealers set-up selling their old minerals at 50% discounts off retail. Prices are good, but the minerals are tired and have been through the show circuit for a year or so. Do not expect any new finds here, unless you are lucky. The Slaughterhouse Opens 8 days before TGMS. Good quality dealers that got tired of long hotel shows so they opened a new venue and open later. This show opens too late for me. I've arrive in town a week before they open, and return home 2 days before this show starts. I cannot evaluate the show, but I do like many of the dealers. NEW IN 2017/2018: Many wholesale dealers and wholesale outlets of big dealers are migrating away from the hotel shows to building that are exclusive to them or a small group. Look for shows at 1801 North Oracle Road; 1893 N 11th Ave.; 635 W Lester St.; 1735 North Oracle Road, plus many others. Read the Tucson Show Guide carefully to find these dealers. Should I Bring Credit Cards or Cash? Bring most of your money as travelers checks. Most dealers accept them and you can always exchange them at a local bank if you need cash. Many dealers accept business checks and credit cards if you are buying for a business. A kid from Morocco that just set up in a tent selling beautiful vanadinite crystals is not going to accept credit cards (he probably can't speak English either). So always have some cash readily available. Are There Other Attractions for Sightseeing? You will find better information on sightseeing at travel site on the Internet. 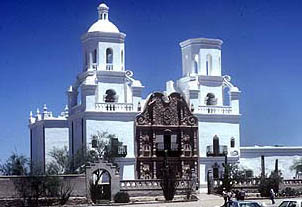 However, I recommend visiting the Mission San Xavier Del Bac, Arizona-Sonora Desert Museum, University of Arizona Mineral Museum, Kitt Peak National Observatory, Pima Air and Space Museum, watching the sunset at Gates Pass, driving to the overlook on Sentinel Peak west of downtown Tucson. If you have lots of time, and want to travel around Arizona, visit the Grand Canyon, Sedona, Petrified Forest or a day trip down to Mexico. Is there Field Collecting for Minerals Nearby? In early March, about 2 weeks after the Tucson shows close, the annual Rockhound Roundup is held in nearby Deming, New Mexico. This is 4-5 days of field trips at various locations plus a mineral show. For more information, contact the Deming (N.M.) Gem & Mineral Society. Travel Hint: If you want local topographic maps visit Tucson Map & Flag at 3239 North 1st Avenue, just north of Ft. Lowell Road (887-4234). Many old topographic maps show the locations of old mines. Should you bring a hand cart? At many shows you can park nearby and easily load into your car. A few shows require remote parking. Hand carts are not uncommon, but it's another think to have to carry on the plane. One dealer uses his roller luggage, filling it as he goes from dealer to dealer, then transfers them to his car when full. How do you Get Minerals Home? Because of restrictions with the airlines, you should avoid packing minerals in your luggage. It is best to carry only the most delicate specimens in a small carry-on bag. Do not overly pack these minerals, because you may have to unwrap them at security checkpoints. It is much easier to ship your minerals home. There are several locations at the shows where you can pay a company to box and ship your specimens. These are temporary branches of companies like Mailboxes Etc. and they are reliable. But you will pay a premium for this service. If you want to save some money and ship the minerals yourself, you can buy boxes and wrapping in Tucson at an office supply store or U-haul dealership and then take them to the United Parcel Service (UPS) at 29th Street and Park Avenue, south of downtown Tucson. An 18x12x12" box will hold 3-4 flats of minerals. Shipping via insured UPS Ground service will cost about $30-40 and will arrive within a week. Many people ship large items via bulk freight. It is cheaper, but it is slower. And I have heard stories of forklifts puncturing through the bottom boxes on a pallet destroying the minerals inside. There are also shipping companies on-site at many hotels to arrange shipping (the most expensive option). I do not purchase enough to make up a full shipping pallet, so I ship via UPS. Travel Hint: UPS may inspect your packages to ensure they meet UPS standards. Minerals must be packed in a box within a box with at least one inch of padding around all sides. If you are shipping many boxes, it might be wise leave one open for inspection to show you packed them correctly. The earlier you arrive in Tucson, the better your chances of getting a "new find" at a reasonable price. It is common for a new lot of minerals to change hands several times between wholesalers and retail dealers prior to the main TGMS Show. Each time the price escalates. By the time they are offered at the main TGMS show, the prices may resemble zip codes or long distance telephone numbers. If you arrive early, you have a better chance at finding genuine bargains before another buyer recognizes their "true" value. Just like when you are field collecting, you must sort through 99.9% junk to find that great "find". Hard work and long hours searching every corner of Tucson will pay off. One of the best strategies is to visit the really out-of-the-way shows to find a mineral dealer that arrived in Tucson without a room reservation and got stuck in a corner. He is probably not doing any business and is facing big losses if he does not sell out. As a buyer, you are in a position to take advantage and negotiate a good deal. Finally, if you have plenty of time and drove to Tucson (so you can carry home a big load), great deals can be made by buying out the leftover stock of a dealer on the last day of the show. It saves the dealer the trouble of wrapping and shipping home his stock. It can result in a BIG discount off his normal prices. The dealer has probably made his profit for the show by the last day anyway. But remember, you are also buying the leftovers. Don't expect to get any new finds or rarities - they sell out quickly leaving nothing unsold at the end except damaged specimens. What Are Your Top 5 Recommendations To See? TGMS - Quite simply the best mineral show in the world. A few days at this show visiting with dealers, attending lectures, looking at the display cases is truly worth the trip to Tucson alone. Hotel Tucson City Center (formerly Inn Suites) - Many of the top dealers were enticed to move from the EI a few years ago. It is a very pleasant locality around a central courtyard with swimming pool. Because the dealers are spread out more, this show seem to lack the "action" going on at the EI. But is an illusion, there is plenty of action at this show. Too bad they lost their huge parking lot and you can no longer park nearby. Days Inn - This is another old show with lots of great mineral dealers. The outside courtyard is filled with tables that dealers in the rooms use to expand their space. Has a more bazaar-like atmosphere. Parking in nonexistent at this show. Park west of this show at the side streets off Congress Street. Ramada Limited - One of the most established shows devoted to fossils and minerals. Many of the best and oldest dealers set up here. Parking is plentiful. Riverpark Inn - An up and coming show with reasonably-priced mineral dealers and good quality. I spend more at this show than any other. Dedicated facilities of various whoelsale dealers like Top Gem, Collector's Edge, Jewel Tunnel Imports, Midwest Minerals, etc. Travel Hint: In addition to the shows and symposium, there are many special events in Tucson for mineral collectors. The Tucson Show Guide has a calendar of events that lists all the fun. Some of my favorites are: Friends of Mineralogy poolside reception at the EI; Jeff Scovil's mineral photography seminar at the Convention Center; the Saturday night silent auction and banquet at the TGMS. I hope this is article help visitors in planning their visit. If you have any comments or corrections, please email me at jhbnyc@aol.com.